This page offers Coffee Storage information in more depth AND if you like, just use the page navigation links to jump to articles of interest. Be sure to check out the storage solutions (some of our favorites) to keep your World's Best Fresh Roasted Coffee soooo FRESH! To Freeze or NOT to Freeze! Should you freeze it or just refrigerate it? Store it in jars, paper, plastic bags, fancy valve bags or 55 gallon drums? Does it really matter if it's whole bean or ground? I mean, come on. How much time do I have before my World’s Best Coffee goes stale...Really? These are questions that concern most specialty-coffee buyers. When building this page, I thought it best to use the KISS principal. You know, Keep It Simple Silly. (My Mom dislikes the word Stupid!) The issue of storage has been greatly clouded by myriad opinions and preferences from a lot of well meaning “experts”. To me, the bottom line is this; certain conditions do harm to the freshness of your coffee. These are the things you hope NOT to expose your World’s Best Coffee to, at least not until the appropriate time! The most direct and simple way to store your coffee without breaking any coffee snob commandments is to buy your coffee in small quantities as needed, WHOLE BEAN, and store it in an airtight canister (ceramic is best) or vacuum canister, in a cool shady spot, possibly on the counter or in the cupboard (could it be that simple?) right next to your handy dandy World’s Best Coffee grinder! “The Perfect Cup” is buying your coffee whole bean and grinding it yourself just before brewing. Proper Coffee Storage for pre-ground coffee is practically a moot point. Clearly there is no substitute for this crucial step to getting the most out of your "World’s Best Coffee"! SO! Proper Coffee Storage Mission Accomplished? No Worries…? Well, O.K., Hold your horses... you knew there was an exception. 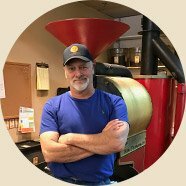 You see a killer ad from your local Roaster or Online Coffee Roasting Company that exposes you to great savings on a bulk purchase of 5 or 10 pounds of that amazing mouth watering favorite coffee of yours. And, well... you couldn’t resist. First and foremost, the fridge is a major no, no. In the first place, it’s not cold enough to keep your coffee fresh. Secondly, your coffee will deodorize and dehumidify your refrigerator-just like baking soda, (yipes!) especially if its ground. That can't be good! is never quite the same after freezing. True or not, what’s important is what works for you. In my experience, if you have a quantity that can’t be consumed within 10 days to 2 weeks, freezing becomes a reasonable option. Just make sure to wrap it well as there can be some damaging exposure to moisture and light from constant opening and closing of the freezer door. #1. Store your coffee in the original packaging. #2. Put each one in it’s own Ziplock freezer bag and if you’re a real stickler, draw out the air with a straw while you close the bag. #3. Then put them all into yet another bag, this time a grocery sack to keep out the light. This may seem a bit much but it will protect your investment from being damaged by moisture and light. Storing coffee at room temperature is a simple and convenient method of storage. It works well for coffee that will be consumed within one to two weeks of purchase. As we have learned, any of these factors can do damage. A nifty solution is a ceramic coffee canister. (or a pair!) They hold 1⁄2 lb. to 1lb. of coffee and the sealing mechanism stops the flow of flavor spoiling air and moisture. Your coffee is also protected from direct sunlight, in case you have a really sunny kitchen. Just click on the picture to take a closer look. 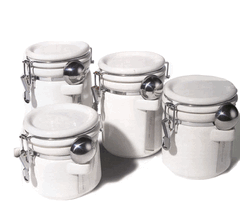 These canisters offer the same good stuff, none of the bad, look nice on your countertop, and they are relatively inexpensive as well. For Those of You Who Prefer to Show Off Your World's Best Coffee...Just Set 'em in the Shade! 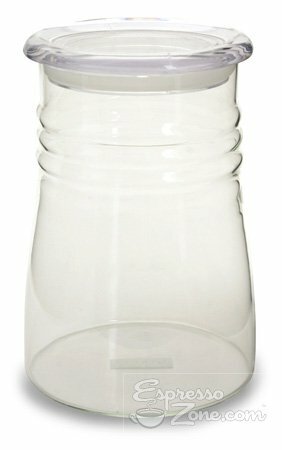 Here is a stylish clear coffee canister that features a special gasket to insure air-tight coffee storage. 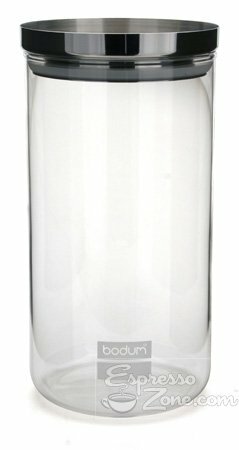 This coffee storage canister is made of borosilicate glass that maintains it's brilliance like no other manufactured glass. So it looks great on your countertop, holds several pounds of coffee, and features a stainless steel lid with removable silicone gasket to insure an air-tight seal. 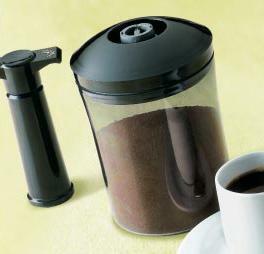 Introducing The Handy-Dandy VacuVin Vacuum Coffee Saver Storage Jar Set w/Pump! O.K.! This smart little storage unit will keep your fresh roasted coffee safe, sound, and FRESH... As we have learned, the more exposure your coffee gets to the elements, the more likely you are to be sipping stale coffee. The vacuum pump removes all of the air from the canister so that flavor and aroma and all of that yummy goodness keeps on being good day after day. I think this is a good choice all around but maybe even better for you folks who have your coffee pre-ground. The shaded container also protects the coffee from the harmful effects of light. This is a mighty handy accessory and goes well beyond what most canisters offer. You might consider getting several of the canisters because they only hold a half pound of coffee. Thank you for visiting our In Depth Coffee Storage Page. I hope it has been helpful. The products selected for coffee storage (shown above) are our favorites (so far) here at Lakota Coffee Company. Although our focus is on supplying the finest coffee in the world, we plan in the near future, to stock and provide all of the very best tools to make the most of your coffee experience as well. We will soon be offering them in attractive "packages" that will most suit the needs of specialty coffee enthusiasts, (such as yourself) and include all of the necessary tools to make your coffee experience match the excellence of the world class coffee that we humbly provide. For now I'll have to be content to share these products via a couple of high quality sites that offer them. Unfortunately, I've yet to find a company that handles them all. That's all for now...Happy Coffee Snobbing, uh, er...Storing! Thanks for visiting our Coffee Storage page...Back to Top!